Unlike bungalows or houses in Europe or America with outward orientation, doors and windows opening outwards, without any private courtyard (backyard yes for miscellaneous purposes); in sharp contrast MNS houses were orientated inwards with doors and windows opening towards a central courtyard ‘sehn’ part of each house. A pattern that is common in entire Muslim world from India westward up to Morocco essentially for privacy and security In MNS in upper storey windows did open outwards on to street. Entrance to the house from street or stable was invariably through a DEWRHI comprising of two room, some large enough to hold a bridge party as it was in our Nai Haveli (NH). Door between the two rooms was offset so that no one could see direct into the courtyard ‘Sehn’. Here in Dewrhi ladies of the house observing purdah would talk to Ghair Mehram men, male servants, artisans like Julahs , Telli , etc across the central wall. Only female staff such as female-cooks, sohagan/nain, maids, etc were allowed in this Zanan Khana. Ladies had to hide whenever men were required to enter for any work or bringing in heavy loads. 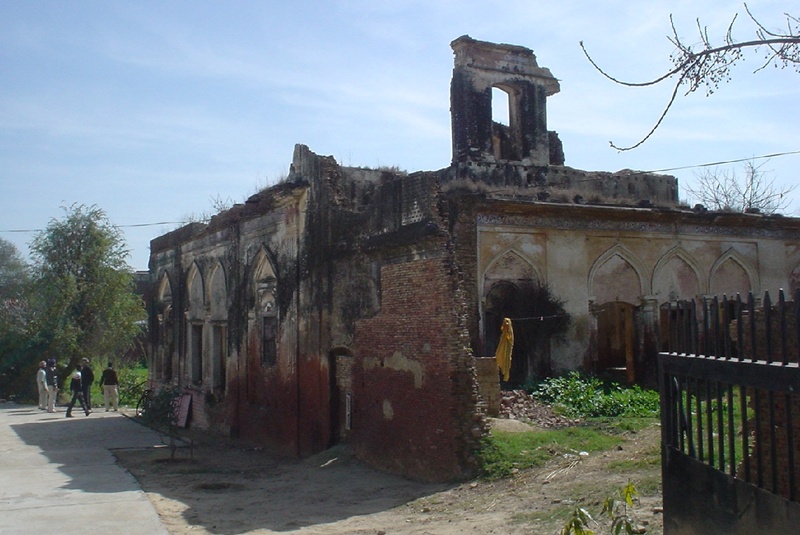 Houses had only single entry through these Dehwris, exception being palatial Namdar House called Dada Ghar by us, which belonged to Abba Mian Zahuruddin Khan. In addition to normal Dewhri there was a side entrance to sehn from chicken house out of house, Persian wheel and side of garden. On top of it there were 8 doors of rooms of the main house opening into verandahs with full access to garden which itself was open at one end to street till a wall was erected by Abba Mian. By the Grace of God nothing untowards happened to my knowledge. Courtyard on three remaining sides had large kitchen having enough space to have casual meals on low table (chowki) sitting on pheeris (low woven stool). Other rooms around the Sehn were stores for general items, and for grains, cotton, other agro products. Space permitting room/s were there to accommodate extra female guest/relatives who according to custom spent long periods with bereaved families or on occasion of marriages. Stairs for upper storey also led from the side of courtyard usually open to sky. Each compound had a small well called kui for manually drawing the water, with a small bucket. Hand pumps started replacing these wells slowly. There was no piped water in bathrooms hence use of hamams or buckets was in vogue. A lota had to be carried to lavatory which were separate from bathrooms. As there were no flush or sewerage system, disposal and cleaning was done by the sweepresses. For hygiene extensive use of phenyl was made. As there was no electricity, lighting was mostly with hurricane lanterns; gas lanterns emitting bright light was used for dinners, parties, or functions. These gas lantern required frequent pumping for pressure. As for fans in summers, broad heavy or padded cloth rectangular piece was hung from ceilings for pulled to and fro providing air to people sitting or sleeping underneath. For all these inconveniences due to lack of electricity, piped water, absence of flush system, there was however compensation in shape of clear unpolluted air, clean healthy water, unadulterated fresh and pure food and fruit of all kind in abundance and cheap too (for example mangoes, melons which were always sold in dharrie of 5 killo costed from one quarter to half a rupee, eaten in bulk unlike 2 mangoes decorating dining tale these days), plenty of dairy products; and most of all a leisurely peaceful pace of life, with a lot of social interaction. Fleet of servants added to pleasures and comforts of life. No wonder they had long lives. When the families grew, quite a few houses were divided longitudinally so that both portions have access to the street. Exception being our Ashraf Manzil aka Nai Havelli (NH) shared by my father Fazley Haque Khan with his widowed sister-in-law Qayyuman Chachi. Haveli was divided athwart with southern portion with the ornate only entrance door of NH, opening into stable, was ours; whereas Qayyuman Chachi’s portion towards North had no opening. 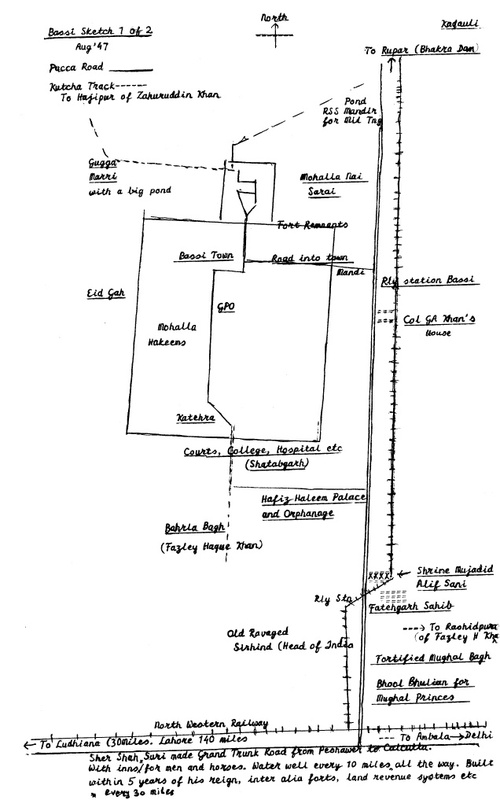 A Dewrhi was, therefore, made of a room with an entrance door opening onto her huge garden and orchard, which was surrounding around all three sides of Chachi’s portion of NH. 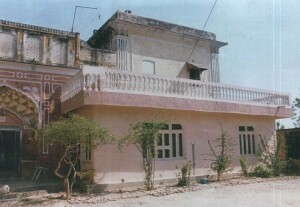 After partition the occupant made a porch over it. As the plaque on entrance mentions Chachi’s side had the modern touch in having big wall to wall windows in living rooms towards North again opening in to garden and orchard. What an indolent life of yore in Bassi. I have heard so much of all our previous history ,I pray that I am able to visit to go back in history and trace the steps of my ancestors! I once had Bare Abba (Gen Fazal Muqeen) write out the shajra, and he with his own hands made the family tree for past at leat 300 years, and I lost it! If my kids here is California could have that. 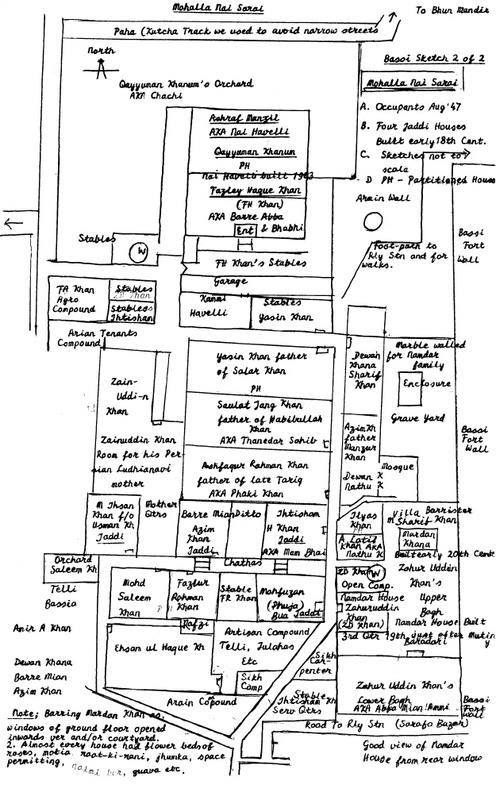 I was just sitting and typed Namdar Khan on google and look what a wealth of Information was there.The hand written maps of Bassi and Nai Sarai Mohalla ought to be in hand of Inam Sir. I am touched with discovery on google.